2014 has the potential to solve the age-old question: can we re-live the Bollinger/Sorgi debates of 2001, only with bad QBs instead of good ones? That’s unfair to both Stave and McEvoy, of course, but the prospect of a camp battle between a one-time walk-on and a guy who played safety last year doesn’t carry the same weight the competition between two future NFLers did over a decade ago. Sidenote: just imagine what 2001 would have been like with Twitter - Alvarez would have blamed a loss on the “tweety, tweedle dumb, whatever it’s called” and people would be reading Nick Davis’ 3AM tweets about his awesome new big screen TV as an endorsement of Bollinger. “Trust the coaching staff” is a fallback phrase for me more often than not, and I’m finding it hard to veer too far from that philosophy with this decision. McEvoy actually looked like a QB in the spring game and the coaching staff is certainly talking big about him this fall. There is plenty of film on Stave and most who have watched him have a good handle what he can and cannot do. There’s going to be a lot of collective bandwidth spent on the QBs over the next 4 weeks, but with McEvoy presumably running, moving out of the pocket, and adjusting to high-level pressure, combined with Stave’s struggles to stay healthy, I’d expect both to get meaningful time no matter who gets the call coming out of camp. We’ll go to a guy who I nicknamed MELGO – after watching an incredible YouTube of his high school games in 2010. You should watch him, you’re already watching him, and you’re loving him. Wisconsin has had a lot of elite running backs, but they may never have another one as talented as Gordon – enjoy it and be glad that nickname didn’t catch on. It was a blast watching Corey Clement beat down and battered defenders in the fourth quarters of games last year, and though I’ve blacked out most of the bowl game, I seem to remember he had a nifty run there. Just looking competent as a true freshman running back is an accomplishment – I could not be more excited to see him make another leap this year. 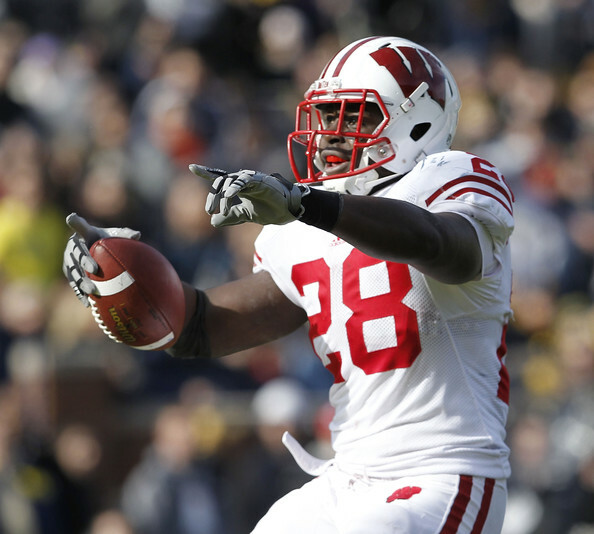 Clement came into the ideal situation last year, getting a bunch of low pressure carries behind two Wisconsin legends. Which incoming freshman RB is going to fill that role this year? Based on comments from Anderson, Taiwan Deal has the inside edge to fill this role in 2014 but Caleb Kinlaw is a possibility as well. We’ll hope beyond hope that the depth chart stays healthy enough that they’re not needed much more than that. Plus, both of these backs have good nickname potential, never a bad thing. Watching senior offensive lineman destroy people is another one of my favorite pastimes: there’s just something awesome about a 325-350 pound, 23 year-old lining up against a younger defensive lineman who is about to get his world rocked. I can’t wait to see the law firm of Lewallen, Costigan and Havenstein blow up hapless defensive lineman and linebackers as Gordon flies by. Following up the historic offensive lines of 2010 and 2011 was no small order, and while these guys aren’t quite at that level, we didn’t see nearly the offensive line drop-off the post-Rose Bowl teams of the early 2000s did. This is my southwest Wisconsin bias creeping in, but I’m driving the Alex Erickson bandwagon at WR – going from a tiny high school, one that didn't even have lights on its football field until last year, to playing WR as a redshirt freshman is an enormous leap. While he was far from spectacular, he looked like he belonged. He’ll never be the speedy deep threat or the flashy physical specimen, but all this team needs is a guy who can get open on the 10-15 yard route and catch the ball. I think he can do this. Speaking of WRs, even with a couple recruiting defections in the last few weeks there is still a lot of new blood coming into the team. Little used Rob Wheelwright has a chance to step up and the true freshman trio of Krenwick Sanders, George Rushing, and Natrell Jamerson all had cool YouTube clips so you know they are good. In fact, seven of the nine scholarship WRs are underclassmen. Seems like a logical down year at the position and it probably will be, but there is unknown potential there if nothing else. Ever since Jazz Peavy gave his verbal commitment to Wisconsin I can’t get this scenario out of my head: Peavy languishes on the bench for the first few games then comes in and makes a spectacular play on a deep ball and heads back to the bench with an “attaboy” from the coaching staff. Twitter erupts with the #FREEJAZZ hashtag and it becomes a thing to the point Potrykus asks Andersen about it at the weekly press conference and Oates has to explain to him just what a hashtag is. I was a bit down on Derek Watt’s transition to fullback a couple years ago because I just didn’t think it was the best use of his talents. Having a good lead blocker and occasional pass catcher is nice to have, but he seemed more valuable running around and killing people on defense. Most comments from the coaching staff suggest he’ll be moved to more of a hybrid TE/FB/H-Back role in 2014. Love the idea of expanding his role a bit more, and with the departure of Jacob Pederson, there is a need for a big bodied pass catcher inside the 20. We’ve listed a bunch of players, but having an offensive coordinator in his second year is a much needed relief after the previous staff turnover, so I’m excited to see what Andy Ludwig has in store for 2014. Hating the OC is a tradition of most football fans, but I thought he was fine last year given the talent he had to work with at QB. He didn’t challenge Stave too much; he balanced the Gordon/White dynamic quite well, keeping both healthy and utilizing their talents in different ways; and though it’s always hard to separate the player and the scheme, but it was a testament to Ludwig’s offensive scheme that Jared Abberderis was able to get open as much as he did despite everyone knowing he was the only capable receiver on the team (and yes, the ten in the box defending the run didn’t hurt). Lastly, I’m excited to see what sort of Touchdown Celebration the RB crew comes up with for 2014. Ron Dayne had his crouch walk into the end zone, John Clay would lay down and catch his breath, Montee Ball liked to point at a stranger in the end zone seats, and of course the Gordon/White dance craze took over the nation last year. What will it be this year? If you’ve been reading this far, you know I’m hoping it involves Jazz Peavy and a saxophone, but the possibilities are endless. If you don’t think part of the reason Gordon came back to school was to refine and perfect his celebratory dance with Corey Clement, I can’t help you. The 2014 season presents many questions for the UW offense. The answers to those won’t be known for months – I can say this right now, though: back in 2001, Bollinger was better! Posted in 2014 Season and tagged with Joel Stave, Tanner McEvoy, Nick Davis, Melvin Gordon, Corey Clement, Caleb Kinlaw, Taiwan Deal, Dallas Lewallen, Kyle Costigan, Rob Havenstein, Jazz Peavy. August 6, 2014 by Buckaround.